When in the Course, this Norman Rockwell painting, appeared on the cover of Life Magazine published June 27, 1918. An alternate title for this illustration is Boy Reciting in Class. This was the ninth cover by Rockwell to appear on Life Magazine. 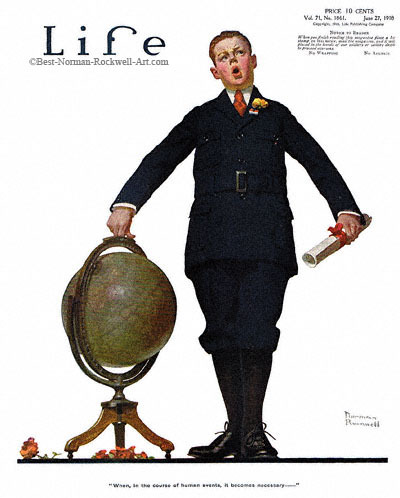 A Rockwell cover illustration appeared on Life magazine a total of ten times in 1918 and twenty-eight times in all. "When, in the course of human events, it becomes necessary for one people to dissolve the political bonds which have connected them with another," so begins the one of the most important documents conceived by human minds, the Declaration of Independence. One of the more drawn-out tortures of attending school is reciting in class. The treatise to be recited is never brief, and rarely is it straightforward. Not that recitation would be easy, even if out of our comic books. This boy has just finished those first seven words. He appears to be straining his mind, grasping for what comes next. He must have known ahead of time that this was recital day. He probably usually wears a suit and tie to school. Today, however, he sports a boutonnière on his lapel. Clearly he is dressed to impress. We do not know with certainty how much of the Declaration he has to recite. Did he have to learn just the opening paragraphs or the entire document, including all the proclamations about King George? We do know that schools routinely taught subject matter that is considered too difficult for today's students. At least the poor boy didn't have to be there when it was written. Now that was a task. One question comes to my mind: Why, knowing that Rockwell painted mostly current topics, was a school painting published at the end of June? School had been dismissed for the summer at least three weeks before. My guess is that the Life editors were responsible for the timing of its publication.